High Caliber Shilohs will have a puppy available from this litter. Rockbridge Shilohs and High Caliber Shilohs are very excited to announce the upcoming breeding of Sapphira to Oz, planned for late March 2013. Oz loves every person he meets and is known for not only his stunning good looks, but his sweet, happy temperament. His classic Shiloh type helped him to achieve his breed championship by winning majors in his first three show weekends, all of which were Shiloh Specialties, including a Winner’s Dog given to him by the famous Fred Lanting at the 2011 Nationals. 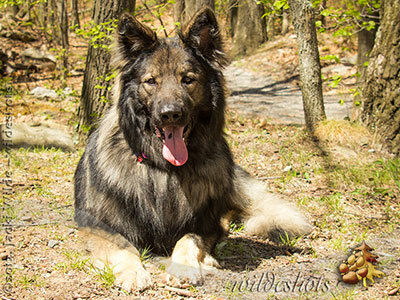 Although Oz enjoys strutting his stuff in the show ring, he prefers hikes in the woods and to romp and play with people and dogs alike. Sapphira is our sweet and gentle “old soul”. 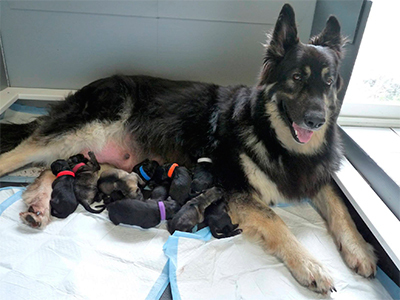 She is the ultimate mother who enjoys every moment with her babies, as shown in this video of her bringing her pups outside for the first time [watch video]. 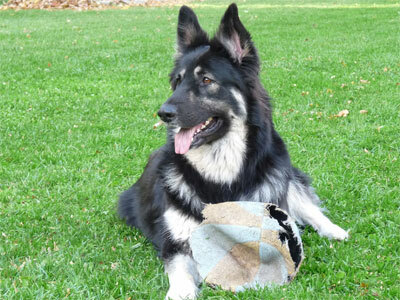 She loves to greet visitors with a gift from the doggy toy basket and is gentle and sweet with children. We expect puppies with outstanding temperaments truly embodying the breed’s reputation as gentle giants. Both parents have excellent conformation with large, solid boning. They compliment each other beautifully. This will be an all plush litter with coats of excellent pigment in rich gray or brown sables and duals of varying shades of black and silver, cream, deep browns, or tans.